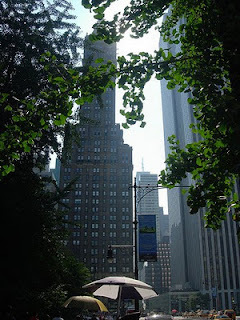 This photo was taken in Central Park, New York by obni on Flickr.com. Ginkgo trees at Showa Kinen Park in Tama, Tokyo, Japan. 360° panorama photo by Seima, panoramic photographer. 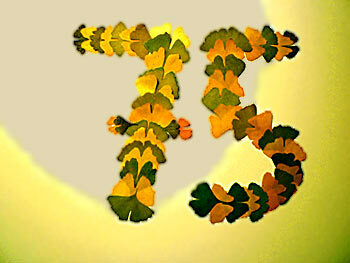 The leaves of Ginkgo trees may all fall in a short period of time, sometimes in one or two hours! This is recorded in many parts of the world in fall. I made a selection of videos from YouTube (thanks to all videomakers!) presented in the playlist below. More info on my website. Kirlian photo of a Ginkgo leaf. 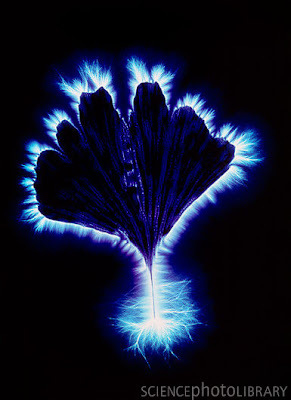 Kirlian photography obtains an image of the electromagnetic discharge (corona effect) between a subject and an applied electric field. The luminosity of the corona depends on many factors including the health of the subject. From - Photo Manfred Kage/Science Photo Library. 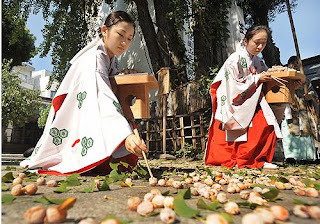 "While studying Art History I fell in love with the grace and form of Asian art. 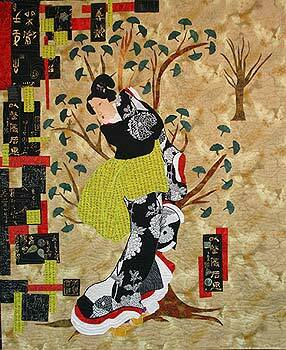 This quilt was inspired by an ancient Japanese wood block print. The graceful Geisha braces against the approaching cold winter wind while the ginkgo leaves swirl around her." View enlargement of this artful design here. * Added several photos/videos on Tree- and Usage-pages. * Added several of my HD-videos on non-English Tree-pages of my website. Ginkgo leaves in November 2011. I made this recording in the Netherlands on November 6, 2011. 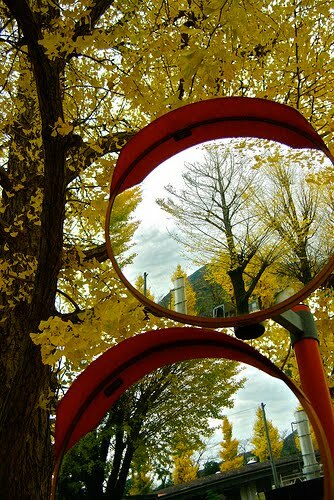 Joel de Courcy Browne from Australia made this special photo of Ginkgo tree reflections in Japan. Photo by Fred on Flickr.com. 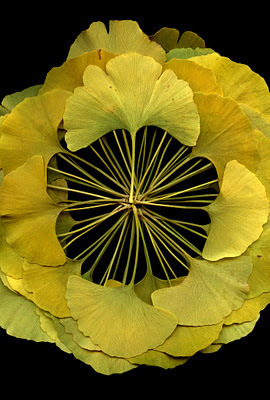 More photos of Ginkgo by Fred on Flickr.com click here. * Added HD-video of Ginkgo in fall in Amsterdam: my YouTube channel and Tree-page. Wieland Haak sent me these photos to let me know he gave his wife Gertrud a perfect 75th birthday present: he made a lovely Ginkgo leaf collage and moreover he gave her a nice Ginkgo leaf collier.